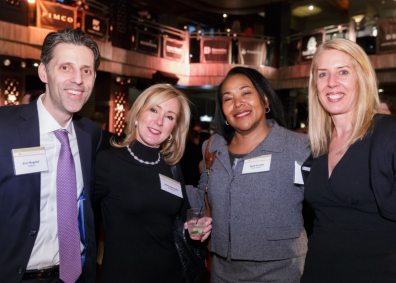 On February 1, 2018 at The Edison Ballroom in New York City, NY, over 550 financial executives and their guests gathered for the 4th Annual Expect Miracles in Manhattan event. Over 60 firms sponsored the event, and representatives from over 100 companies joined Foundation Sponsors ICE Data Services, BNY Mellon, and Eagle Investment Systems in support of cancer research at Memorial Sloan-Kettering Cancer Center. After an exciting live auction and tremendous support from the crowd, Event Co-Chair Margaret Flynn-Martin, Morgan Stanley, took the stage to thank everyone for all their philanthropy and encourage them to pledge to support Expect Miracles Foundation. During an exciting Text to Pledge campaign we raised $95,000, an astonishing $35,000 more than our original goal. Thank you to everyone who was able to pledge! Finally, Executive Director Frank Heavey came to the stage once more to present two awards. The first was the Expect Miracles Award, which recognizes the individual or organization that best utilizes their influence on others and generous spirit for the betterment of society, and goes above and beyond to donate or raise significant funds for Expect Miracles Foundation. This year’s award went to Scott Brady, Columbia Threadneedle Investments. The next award was given “in special recognition and with sincere gratitude for 10 years as Foundation Sponsor leading the financial industry in support of the life-saving mission of Expect Miracles Foundation.” This award was presented to ICE Data Services for their 10th anniversary of Foundation Sponsorship. Lynn Martin, President and Chief Operating Officer of ICE Data Services, came to the stage to accept the award and shared a touching story of how cancer has affected her family. Thank you to our wonderful guests, sponsors, partners and volunteers – YOU are the Cure. If you did not get a chance to donate, you can do so here. You can check out even more photos on our Facebook Page! We hope to see you at our next event, the 24th Annual East Coast Classic charity golf tournament on June 14, 2018 in Plymouth, MA.